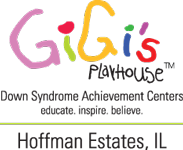 GiGi’s Playhouse presents the 6th Annual National Golf Outing on Monday, August 26, 2019 hosted by Wynstone Private Golf Club in Barrington. Your support empowers heroic children and adults with Down syndrome. We are so EXCITED to announce that AMY BOCKERSTETTE will be joining us. For more about Amy's story please visit  https://bit.ly/2UzeYhv. Don't miss your chance to beat this PRO!